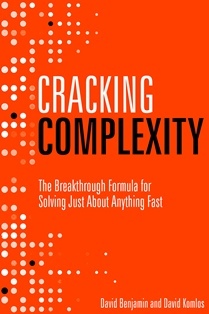 The result: explosions of brainpower and emotional commitment that produce major leaps of progress in compressed timeframes – in business, tech, healthcare, government, NGOs, and anywhere people are trying to solve complex challenges. David Komlos. CEO, Syntegrity, is an entrepreneur, early-stage investor and speaker who has helped change the way many global leaders approach their top challenges. From Fortune 100 transformation to international aid, content creation in sports and entertainment to improving access to life-saving products, David advises top leaders and enterprises on how to dramatically accelerate solutions and execution on their defining challenges. He frequently speaks on topics related to complexity, fast problem-solving and mobilization, and scaling talent. He lives with his family in Toronto. David Benjamin. is Chief Architect of Syntegrity's implementation of the Complexity Formula and regularly guides leaders and their teams through their application of the formula, helping them get to decisions and action in days, no matter the industry, type of challenge, or nature of the organization. In this capacity, David has become a trusted advisor to Fortune 500 companies and government leaders on how to organize for complexity and find traction in the face of the intractable. He frequently speaks on a wide range of topics related to complexity, effective and efficient problem-solving, and human dynamics in systems. David spends most of the rest of his time and energy on writing, family, long-distance running and cracking cryptic crosswords. David and his wife, Angie, live near Toronto and have three incredibly talented daughters whom he loves equally. Registration is subject to availability and will close on Wednesday, May 8 at 4:00PM- No Exceptions! Cancellations must be made at least 48-hours (business day) prior to the event date by sending an email to Gabriela Sanchez. Refunds or credits for future events are not available for any no-shows or late cancellations.